Note! The below post and its comment section may contain information that people avoiding any and all spoilers should probably stay away from. Then, yesterday, came a very revealing Entertainment Weekly article with a couple of new set photos, and lots of information about where we’ll find our favorite characters when the season begins. I will discuss some of this below, so people wary of even the slightest spoilers should probably stop reading right here. (I guess your main takeaway will be to remember to tune in to Netflix on October 19.) One of these set photos, a variant of one of the others, and one not found in the EW article at all, can also be found at spoilertv.com. The info in the EW article is really quite revealing. It seems that, while Matt and Foggy aren’t reunited right off the bat, we at least don’t have to wait until much of the season has passed for Matt to come back from the “dead.” There’s not mention of Karen though. What doesn’t surprise me is that the events of The Defenders have taken a physical toll on Matt in ways that will be evident at the start of the season. 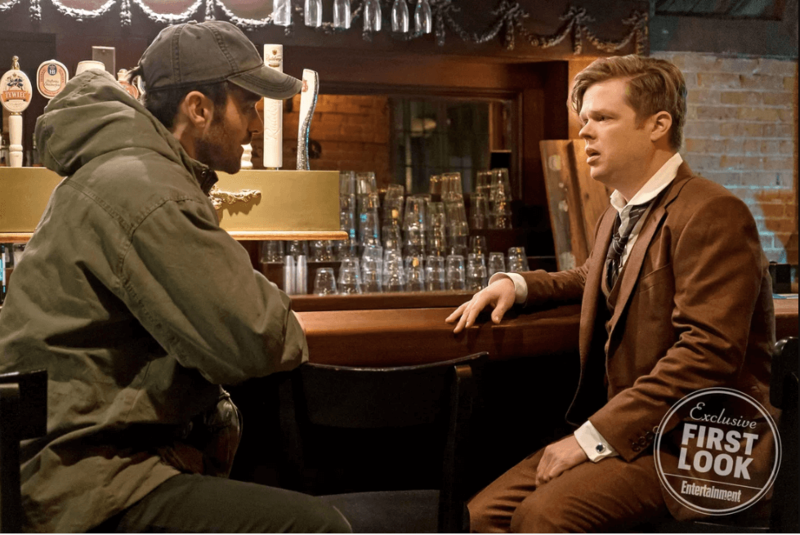 We know he had a building drop on him so the idea that he’d snap back with no trouble at all would seem pretty implausible (I’m impressed by how frail they’ve actually made Charlie Cox look in the bar scene above). We also had that bit of foreshadowing in season two were Matt had his senses go on the fritz after a head injury. There’s a very well-known story from the Miller run which leads up to the in-story introduction of Stick that sees Daredevil dealing with the loss of his radar sense, which I suspect they may have borrowed some of the inspiration from. That this seems to take Matt to a very dark place doesn’t surprise me either, as he is pretty much the textbook definition of someone who bases their self-worth on accomplishments (only). This may also be the reason he allows his friends and allies to go on believing he’s dead for some, as yet, unidentified amount of time. He’s probably convinced himself they’re better off without him. I really, really hope they do something interesting with this though. In fact, I will probably have to come back to this topic. I’m really digging the fact that showrunner Erik Oleson seems to have been given pretty free reins. I love stories that remind me of classic Daredevil moments, but I don’t need faithful adaptations of entire storylines. After all, you want there to be surprises and brand new content to enjoy. Well, I guess I should end this with some Bible verses from the Daredevil Twitter account. The more I think about it, I feel that the article (and Oleson) never brought up details about Karen because of major spoilers. I’d actually say that of the Avocados, Matt and Karen’s relationship is probably the one side of the triangle that’s gonna undergo the biggest change this season. After all, Karen has yet to undergo the growth Foggy has already undergone as far as coming to terms about Matt being Daredevil, especially since she and Matt have not spoken to each other that much since he told her his secret. And unlike Foggy, Karen has her own secrets and dark past (with Wesley and what happened to her brother), and we know that’s going to be explored more in depth this season, and Matt has generally missed out on Karen’s more impressive feats. That sounds like the sort of thinking Stick kinda embodies. You know, this reminds me of some people I’ve seen recently who don’t want Bullseye to be complex or humanized and just want him to be a straight up carbon copy of Earth 616 Bullseye, rather than the fleshed out and more complex character we’re ultimately getting (as Bullseye is really in his “origin story” this year for season 3, in the same way that season 1 was as much about Fisk evolving into the classic Kingpin persona as it was about Matt’s evolution as a superhero). Like, Bullseye has to be more grounded and have limits to his evilness, lest he come off like a cartoon character. The descriptions from the EW article make me think he’s likely to take a lot of cues from Ben Barnes’ version of Billy Russo. It bugged me that they call Karen his ex-girlfriend since they never made it beyond one date because Elektra swooped in and dragged him off last season. Love interest, yes. Girlfriend, no. I suppose they didn’t have enough bandwidth to get into the particulars. I’m really looking forward to seeing what they do with Maggie since the comics introduced her and then didn’t elaborate for about 30 years (except for a few drippy scenes in one of the miniseries). I really hope they make her a character rather than a cameo. I’m looking forward to seeing Daredevil (always do). I hope they don’t leave us with a cliffhanger since a future season seems up in the air with the Disney streaming service on the horizon. I was afraid that might mean they would phase out the Defenders shows. I did find it interesting that an article I read recently said that Disney controls the movies but Marvel controls the TV shows except for some upcoming Disney created Avengers spinoffs. Maybe that means they will continue to work with Netflix for more Defenders characters seasons? Inquiring minds want to know. I mean, the two terms are not synonymous. To the best of my knowledge, the shows that are currently aired on Netflix will stay on Netflix. You’re correct that the terms are not synonymous, which is why I used them. I thought “love interest” fit their relationship rather than “girlfriend”. To me girlfriend implies mutually exclusive, have gone on more than one date. Love interest could be somewhere from mutual attraction through actually dating. Personally, I really hope Karen is the first to learn Matt is back. Because I honestly feel they need to have their “Nelson v. Murdock” moment. I kinda hope that that will be the second episode. It would make sense for it go this way for the impending story of season 3, since Karen probably is obsessively keeping tabs on Fisk, and Matt needs to somehow find out that Fisk is about to get out of jail (plus I think it would make a lot of sense if Karen pressed Matt to talk to Foggy on the grounds that “He deserves to know from you firsthand that you’re alive, and he deserves to know from you that you put him on Fisk’s hit list”). And since Karen is becoming the New Ben Urich, I’d love to see a lot of collaboration between Matt and Karen in investigating Fisk this time around. But I’m also expecting the writers to do something different and totally disprove what I’ve just written. Sidenote, anyone else think that Foggy in that picture looked like an upcoming District Attorney with that very sharp three piece brown suit of his? @Elizabeth: Marvel is staying with Netflix for these shows. 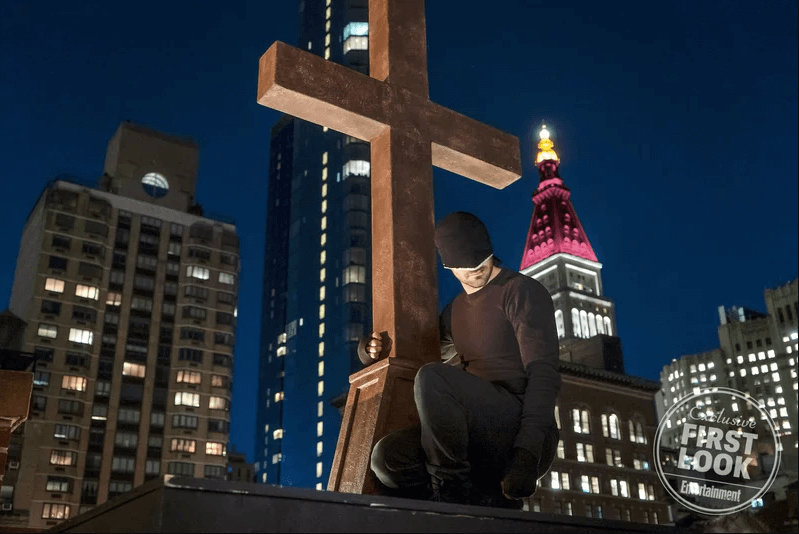 Not only have additional (Netflix) seasons been green-lit since Disney’s streaming plans became public, it seems Marvel has further plans for possibly several more seasons of Daredevil. It has some new photos, including one of Matt sparring with someone in the convent (https://pbs.twimg.com/media/Dn0RQDBXkAEm_95.jpg:large), and another of Matt and Karen at a funeral. (https://pbs.twimg.com/media/Dn0NJGSXcAckfl9.jpg) I’m really interested in how Matt could find a new sparring partner in the convent. Also, this article has some spoilery details about how Fisk will get out of prison. Christine : Will you review Daredevil comics again? , If not the current run some classics. Be well. Do you plan to review Daredevil comics again?, if not the current run more classic stories. The religious symbols and biblical references make me wonder whether we’ll see Fr. Lantom in season 3. If Matt is going through a crisis, he would definitely benefit from a latte and conversation with his priest. But perhaps he’s not in a frame of mind to hear what Fr. Lantom has to say to him. In one of the recently-released season 3 photos, we see Matt in his black outfit and mask, standing in a parking garage. He has wrapped rope around his hands and forearms. I’m reminded that he did the same thing in episode 1×02, “Cut Man.” After cutting down the Russian fake cop on Claire’s roof, he took the rope and wrapped it around his forearms and hands. Then he went off to the epic hallway fight. 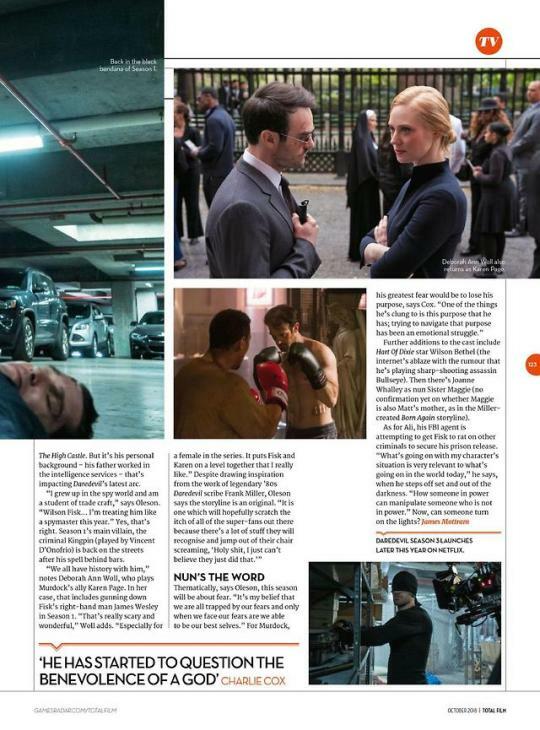 Charlie Cox has said there will be a scene recalling the hallway fight in season 3. Could this photo be part of it? We haven’t seen any ninjas yet. Fingers crossed . . . .
@Donald Thanks for sharing the links to the article and pictures, I saw the pictures on twitter and couldn’t find the source. I’m excited, but I’m trying not to be too excited. Two and a half years is more than enough time to build unreasonable hopes and expectations. I don’t want to be disappointed. I’ve said before that all I want is the complete absence of mystical ninjas, but of course I’d like to see other things too (like the rest of that scene at the end of season 2). 23 days and 9 hours to go. @Jenny: Well, I think you can sleep easy knowing there are no more ninjas to deal with. And agreed, with it strongly hinted that there will be a heavy Matt/Karen focus this season as they work together to investigate Fisk, a few flashbacks that show the rest of the reveal scene would definitely be appropriate. As far as I know the actor who played Father Lanthom died. But Charlie Cox mentioned that he spent a lot of time in a confessional box, so there is probably a replacement? I really liked the actor and the way Father Lanthom was written so far. @Martha: As far as I know, Peter McRobbie, who plays Father Lanthom, is very much alive. Maybe you’re thinking of Reg E. Cathey, who played Luke Cage’s father (also a clergyman) and died earlier this year? @ Christine @ Nora: That’s a relief! Peter McRobbie and Charlie Cox do great work together. I, too, hope we see Fr. Lantom in season 3 . RIP Reg E. Cathey. He was wonderful in Luke Cage. @Martha: And I hope Father Lantom doesn’t bite it during the season (that photo of what looked like Matt and Karen at a funeral, in which a few of us suspect that you can see Fisk in the background obscured by Karen’s head). The new photo of Matt with Karen raises lots of new speculation for me. I get the impression that Matt and Karen will be doing a lot of collaborating to investigate Fisk and probably from jump. 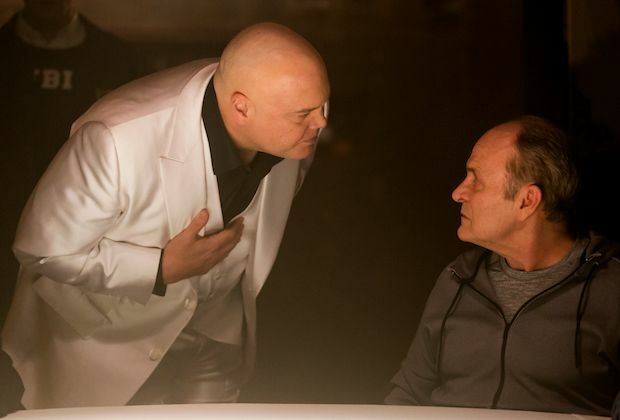 Karen knows she can’t take Fisk on by herself, so she needs someone who knows almost everything about the inner workings of Fisk’s organization. 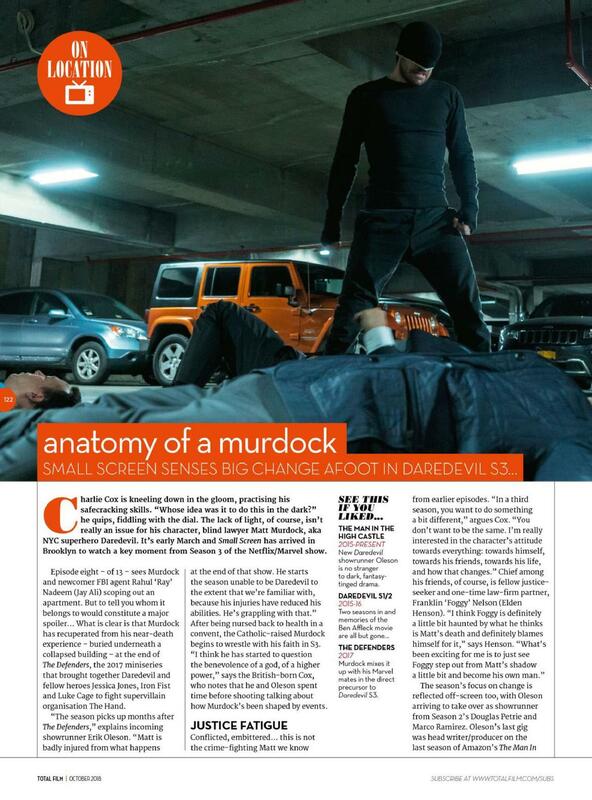 Foggy will not be drawn into the case right away, but he will when Fisk starts setting his sights on Foggy and Marci. I guess you are to busy to answer my question. Take care. I’m sorry I didn’t respond to your question right away. I’m not sure I’ll start reviewing the ongoing again any time soon. I would like to get into the comics side again, but I’m gently easing back into blogging so I’ll continue choosing the topics that speak to me and build up from there. This reminds me of the recent “explanation” for why Scarlet Witch doesn’t have an accent in Infinty War. It had something to do with her need to be able to disguise herself or something like that. But a foreign accent isn’t something people cling to on purpose. So weird. Still more than two weeks! @Elizabeth: I wonder how they would do this. Skylar Gartner has aged four years since season 1. So if there are any scenes they would have to use another child actor? @Nora + Elisabeth: Actually, I think it’s perfect that Skylar Gaertner has aged four years. That makes him perfect for a flashback to a scene where Matt is a few years older. But if they want him younger, they could probably still do that. The actor is doing Ozark these days and he’s still pretty young-looking. I did notice that, in the second season of Iron Fist, they had a different child actor play a slightly older Danny than the one we saw in the first season. @Nora & @Christine: I was originally thinking of Maggie leaving when Matt was a baby, but him as a kid growing up in the orphanage would be even more interesting. I agree that it would be an “unusual childhood”. While he never interacted with Maggie in the comic books until he was an adult in Born Again, that doesn’t mean that the show has to match. Maybe she influenced where he went based on the voicemail Jack left and kept an eye on him from a distance or met him but didn’t say who she was?